A survivor of the system but no thanks to the DWP. Last week I met a lovely man once again. I didn’t recognise him, and I had to look twice. The last time that I saw him he was very thin, he was hungry and very depressed. Why? The Jobcentre kept sanctioning him even though he had fully complied with his job search requirements. It had got that bad that he was very close to loosing his home and he was thinking of taking his own life. The DWP had taken every bit of hope away from him. He had nothing left inside him. Both myself and his girlfriend had given him some advice and he survived. He sat opposite me, and I told him that I didn’t recognise him, his whole persona had changed. There was a spark in his eyes and he had put a lot of weight on. I asked him what had happened, and he told me that he himself had found a job. Timpsons the shoe repairers had given him a chance. He says that he didn’t think that he would have got the job, but they are a family company and don’t just employ someone because they tick all the right boxes on their C.V. They go off personality as well and strongly believe that giving someone a chance is the best thing that they can do. He started paid work. 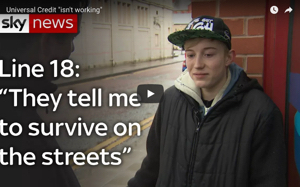 Not workfare he had done that before and it had made him Ill. Working for nothing on an empty stomach is nothing less than slavery. He says that he is treated like a part of the family now, and given so many opportunities to learn and grow more that he’s spoilt for choice. As a result he says he feels human again. I asked him what does that mean? And he explained. He added that his experience has traumatised him for life and he wasn’t sure that he would recover. This man is a hero in my eyes. I will never forget meeting him again. And I cannot thank Timpsons shoe repairers for helping him like this. They give people a good, honest chance. As for workfare, it’s wrong and if you are in the mindset of thinking that it’s right then I encourage you to read this story again. It nearly caused him to end his life. This gentleman is a true hero. If anyone from Timpsons would like to get in touch with me to comment that would be fantastic. Also there is a scheme in my area which is ran by the local volunteering organisation. It’s called keep volunteering voluntary. They are encouraging local traders and charities to stop using workfare. Many already have. We need to spread the word that workfare is wrong. If you are looking to employ someone then put them on a paid work trial. Don’t use their hard work for free and then complain that they have an attitude as a result. That attitude could be because they are hungry, amd remember the next work fare employee could take your job. I’ve heard the words “well they are the workfare” being used. This is wrong and I am and Boycott Workfare are trying to change this. Please donate to help keep our campaign going. We work very hard at this and it has become more or less a full time job for me. Doing my job. A song by Eliza P singer/ songwriter. After waking this morning I realized I’d lost my last £50.00 and 6 days bus pass. after that is, losing my top front tooth a few days ago–very depressed!! Then I read this story which has really cheered me up. Best wishes to you and your friend, and of course the staff at the friends new workplace at Timpsons. Nice story Charlotte and best of luck to your friend. Thank you so much for sharing this with us. It’s brought tears to my eyes, not only out of happiness for this dear man, but sadness for the many thousands that are being treated worse than animals. Animals, your pets, get food, water, and lots of love along with that, but people it seems are barely worth even supplying with water it seems, let alone the basics for leading a well balanced and fulfilling life. I was saying to my mum yesterday about these things, all of the suffering and the death, yet Cameron and Smith go to church and supposedly have a deep belief. I told her that if they do believe, I wouldn’t like to be in their shoes when they are required to explain themselves on judgement day. We all do things wrong in some ways, but what they have done to the poor and disabled, and are about to do to the working poor, goes over and above anything that could be forgiven by their ‘god’, though it’s not for anyone to judge of course. I honestly think that when these evils are fully exposed, all those involved will face the courts. I wish that I could sit in my wheelchair each week and support you Charlotte, but like many here, we are there with you each week in spirit and in prayer. Thanks for this inspiring report, and apologies if the answer to this question would be clear if I were a regular reader (this is my first time here, but I’ll be back)! I’m writing an article about (and against) the way in which Universal Credit allows the DWP to extend its sanction regime — could you let me know which jobcentre this man was forced to attend? 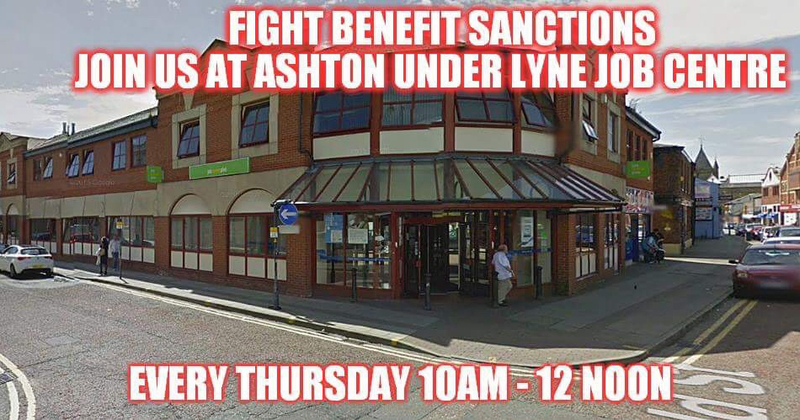 It was Ashton under lyne Jobcentre.. Most of my reports come from there because we demonstrate there every week.